What: Have your product shot with model in a summer theme photo shoot. Use the photos to promote your products on your social media and else where. We can share the photos on our social media accounts too. Costs and funding details: http://bit.ly/2v2yeKI. The money raised will pay for the models and makeup artist’s time, theirs and my transport, and other incidentals. For the two shoots, it will cost about USD$2000 equivalent. Actually, our PayPal and GoFundMe accounts are linked to the Australian Dollar (currency of Andrew’s receiving account for international transfers), so don’t be surprised when this crops up. Benefits: You don’t need to spend USD$1000 or $2000 for an exclusive photo shoot, instead, you can cost share. Minimum contribution is AUD$100 gets you five different photos (full and web-sized, total 10). AUD$200 gets you ten different photos (two sizes, total 20). AUD$300 gets you fifteen different photos (two sizes, total 30), and so forth. Best for: These shoots are great for start up companies needing high quality photos with an exotic atmosphere. This gives your product an international / global look, making you seem bigger than you are. Model(s): Not yet confirmed, but will be young Japanese women, and may be men (it is very difficult to find male Japanese models). Here are some of the models we’ve worked with in the past: http://ablyth.photoshelter.com/gallery-collection/Models/C0000quDQSfYbu8k. Guarantees: As you know, all projects have risks. However, we do have a track record of delivering and for quality. See for yourself here our photo library hosted on PhotoShelter. Tell us your social media accounts so that we can post and link the posts to you. (found) Models. Men, women, young, old, whatever. Theme: Japanese summer. Shoot 1 “At home”, Shoot 2 “Girl in Tokyo”, Shoot 3 “At the beach”. When: all day, 8th August 2017. Where: This is only open to models & MUA already in Japan. Shoot 1, Indoors, 8th Aug: At a traditional style Japanese house, near central Yokahama. Kisami, Shimoda, Izu Peninsula, https://goo.gl/maps/ZPSVX1iymby. Why: 1. Actually, I’m not normally available to shoot in summer in Japan, and so I have this big gap in my photo library. Also, I really don’t know what to shoot, and so I need some practice and a chance to experiment with a summer theme. 2. Some of these will be sample-photos to call for sponsors for future shoots. 3. Product placement shoot (if sponsors can be found in time). Paid: For the right model & mua, yes I will pay. What to wear: Summer fashion themes. Strictly, no brand names, no logos, and no copyrighted designs. This will be a low-budget shoot, and so you will need to use your own wardrobe. Shoot 2: Something that looks good, but can still look nice in 10 years. Shoot 3: Swimsuit(s), beach/summer shawl, hat, sunglasses, flip-flops, towel. (You will need to get into the water). If you have another idea, please tell me. Other: A model release needs to be signed, and you cannot have exclusive contract restrictions for too many products. More info: My standard model call (en) and モデル求人, 日本語 (jp), contact me and I can send the draft shoot plan. Summer #coupon! Get 40% off instant download photos! Just for this summer, get the biggest coupon offer we’ve ever released! Get 40% off any photo download purchase made via my PhotoShelter portfolio. Offer valid until the 31st August 2017, with a USD$25 minimum purchase, unlimited use. The offer may be cancelled any time if abuse is apparent. A young Japanese lady in Asakusa and Sensoji Temple, Tokyo. Galleries: Miyu, and Tokyo. A young Japanese lady in Asakusa and Sensoji Temple, Tokyo. 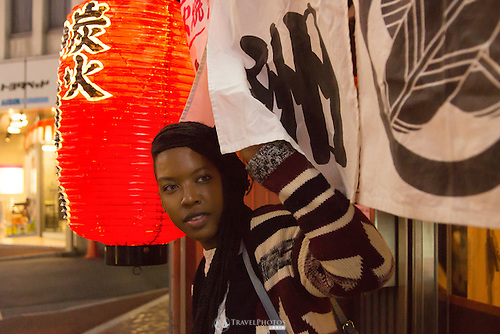 Gallery: http://ablyth.photoshelter.com/gallery/Miyu/G0000icZgc.Msf1o/C0000quDQSfYbu8kA young Japanese lady in Asakusa and Sensoji Temple, Tokyo. A throw back from 2014 with Hieu in Saigon Vietnam. I rediscovered this while planning a shoot for August. I’m looking for models in Nagoya and Tokyo. Details: http://bit.ly/2vZ4xHm Update to the JapanesePhotos Instagram at: http://bit.ly/2vZRk18. Wanted: Models. Men, women, young, old, whatever. When: Summer (Any time now to mid-September), but contact me as soon as possible, so I can fix my schedule. Where: Mostly Nagoya (Sakae, Shin-Sakae, Higashiyama Botanic Gardens, Tsurumai Park, or even Shin-Maiko on the Meitetsu Line), but I may also do a trip to Tokyo and Kyoto. For travelling models, look at my Nagoya, Kyoto, and Tokyo pages for ideas. Young Japanese lady at Sensoji Temple with Tokyo Skytree in the background. Why: Actually, I’m not normally available to shoot in summer in Japan, and so I have this big gap in my portfolio. Also, I really don’t know what to shoot, and so I need some practice and a chance to experiment with a summer theme. Paid: For the right model, yes I can pay. Otherwise, TFP (Trade for photos), which is perfect for models wanting their first photos for their portfolios, for professional models wanting shots for their Instagram feed, and creative models & MUA wanting help on a project. What: I’d prefer to show typical Japanese summer themes like fireworks, festivals, but also water and sea. However, I’d be happy to hear your ideas and creatively plan a shoot together. What to wear: Depends on the theme and creative style we can plan. If a summer festival, then a yukata would be great. If in the city, then summer fashion themes. If you have another idea, please tell me. More info: My standard model call (en) and モデル求人, 日本語 (jp). Young American lady leaving a restaurant in Nagoya, Japan. You can, but no you don’t have to wait for me to answer emails, offer quotes, await your reply for which photos you want, pay a USD$10 order surcharge, and wait for me to email the photos. Also, remember I’m in the Japan timezone, and so there are the delays caused by wake-sleep patterns of you and I. How to purchase and get discounts at my PhotoShelter portfolio. 3. Choose your size. These days most images look better at a larger size of about 800 to 1000px, but eventually that will soon be too small. Think long term, be safe and avoid the old and dowdy look of having images that will be too small. So, most people will choose the 1500px option. 4. Continue shopping. Usually, there is a minimum purchase requirement, and so you might need to purchase at least one more image. 6. Coupon Code? Under Order Summary, click on “Coupon Code?” and enter the code here. Then click “Check Out” again. Look here for any current coupon campaigns. 7. Order Summary & confirmation. Click on the “I have read the blah blah blah”. Here you will see the total price. You also have two options. 1. Use PayPal, or 2. Use your credit card using the secure PayPal system. I do not see or store any of your credit card information, ensuring good security for you. 8. PayPal will take you from here. I’ll admit that I don’t remember what happens next, but I assume after the PayPal process, you will be directed back to a page and a button that says “Download” for the ones you just purchased. I do see some details of website activities, and so I can help if you come unstuck somewhere. If you have have any problems, please contact me. 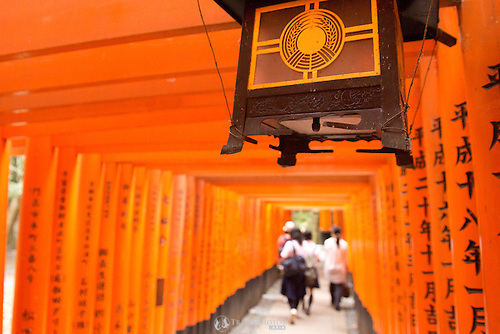 In Kyoto, you will see the most beautiful city scenes ever. Kyoto cannot be recommended enough! Whenever I do these “5 Things” lists, I always feel a little apprehensive because I wonder, “Can I think of five things, whilst avoiding the clichés?”. However, the problem with Kyoto is the boundary between highlight and cliché is not clear, but it doesn’t matter. Everything you see in Kyoto will be a highlight of your life! My advice: Don’t care, be shameless, use a selfie stick, enjoy Kyoto to the fullest. 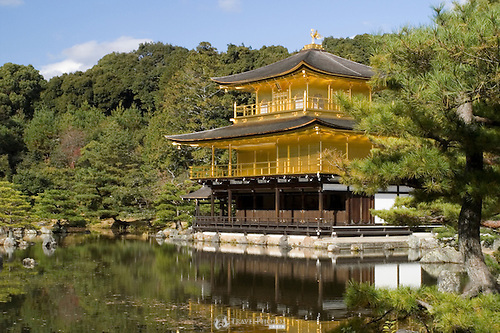 This list is spectacularly short compared to what Kyoto has to offer. I plan to do another “5 Things to do in Kyoto” list another… five or six times? We’ll see. I don’t normally like buses, as I don’t really trust them. They appear and arrive out of nowhere, and then disappear into the traffic to nowhere; I don’t know where they will take me. Trains, on the other hand, have tracks and a clear map that show definitely where they’ve come from, and where they are going. You cannot get (very) lost with trains. 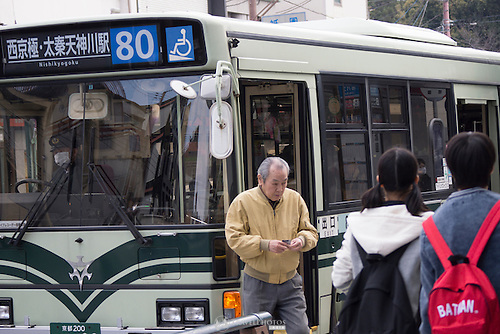 However, Kyoto city buses are AWESOME! 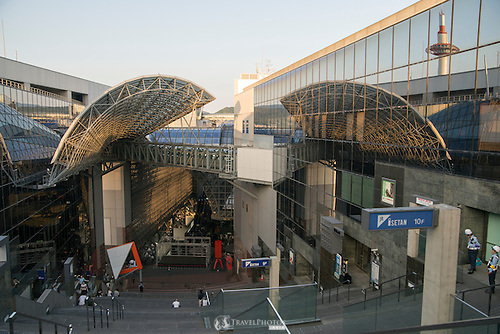 As soon as you arrive at Kyoto station look for the tourist information centre, buy a City Metro day pass and get a map in your language. The map is very clearly laid out, very simple to read, and you can quickly and easily see how to get to the places you want to go. Also, the buses are very clearly marked. The buses in Kyoto are the only buses in the world I trust. 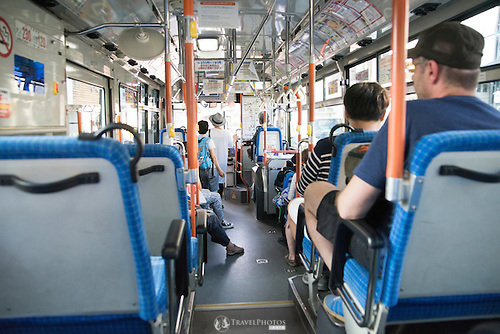 However, they can be slowed down when stuck in afternoon traffic. To use them, get on via the back door, and then at your destination insert your day pass through the machine as you get off through the front door. There are multilingual TV screens on most buses that announce what the next stop is, so you can’t go wrong. The auditory announcements can also help you learn the correct pronunciation of the place names. This is Japan’s premier tourist attraction. This is the number one must see for all Japanese and non-Japanese in Japan. You haven’t visited Japan until you’ve seen this. However, remember that it is just a humble building, gold leaf coated, rebuilt in the 1950’s. This site alone receives visitors in the millions annually. Consequently, arrive at or moments after 9am, and rush to get ahead of the school and tour groups, but be prepared to get swarmed anyway. You will probably have just five minutes to enjoy this scene before you get elbowed or bumped one too many times. Walking around the place is calming, even if the main viewing area isn’t. Fortunately the grounds staff and security are very, very well practiced in shepherding people, and so the first real sight you see is the Pavilion itself, and then you can relax and unwind in the twenty or thirty minute stroll through the rest of the grounds. Yes, you can have a hot sweaty man pull you about in a comfortable rickshaw. It’s actually a great way to meet a local who can give you an introduction to the area, and give you ideas and travel advice. Besides, how many times in your life can you get this opportunity? Try it at least once. 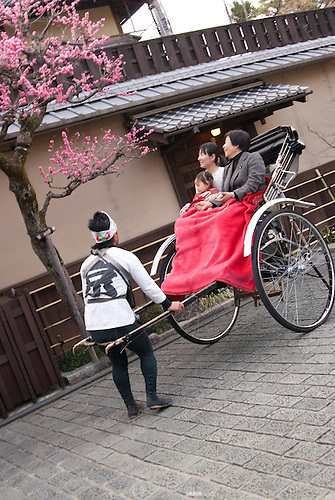 Also, I have seen women rickshaw pullers in Tokyo, so may be there are some in Kyoto now. 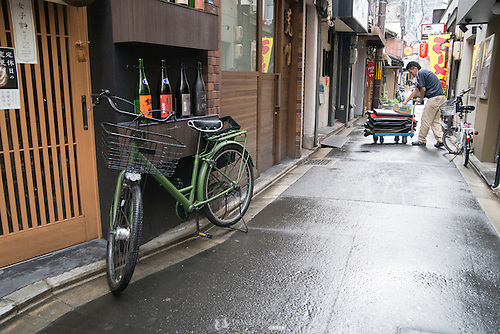 Most rickshaws can be found in Gion close to the Ginkakuji Pavilion (the “Silver” one). Gion boundaries are not clear, nor traditionally defined. I guess the definition of “Gion” is the nighttime geisha/maiko area, and the temple and shrines that are super popular with tourists. 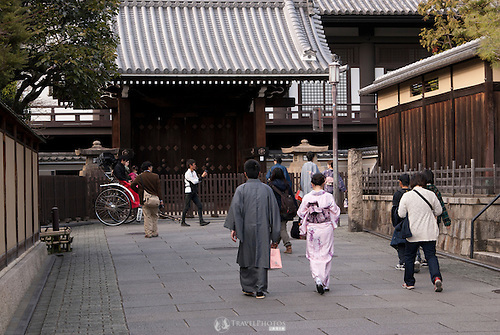 So this area includes Ginkakuji, Kiyomizu Temple, Yasaka Shrine, Kodaiji Shrine, and more. I’ve said before that “Tokyo is made of stairs” here. Fushimi Inari is also made of stairs. In fact, you will do a lot of walking in Kyoto. As if travelling and new experiences aren’t energy sapping enough, walking and stairs add to it. However, Fushimi Inari is grand. Take a picnic lunch, get there early, and slowly wander through the tree and orange-torii covered hill. This is a place where you can relax and recharge and forget about the stress of travel. To be honest, I find Japanese food salty and not to my liking; consequently, I don’t actually have any Kyoto-food photos to show. That said, there are a very many Westerners who absolutely love Japanese food. 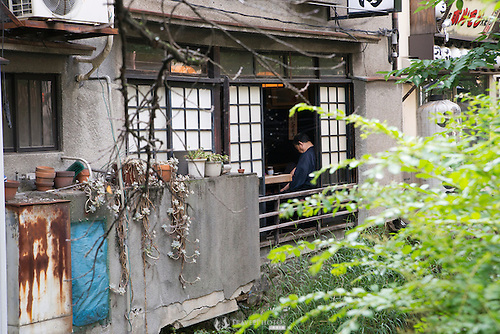 For them, Kyoto is a Mecca for Japanese culinary cuisine. How do I survive there? I look for the ramen shops, the “yakitori” (grilled meat on skewers) restaurants, and franchise places. The best places for anyone for dinner is definitely in Kyoto station on the upper floors, where you can browse and even find Korean and Chinese restaurants. 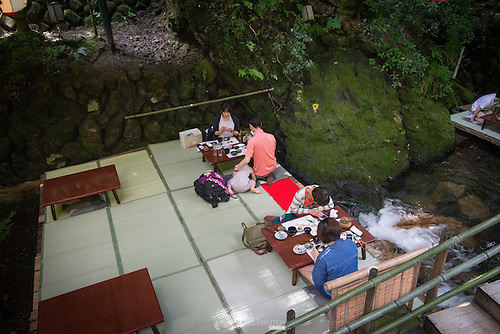 For a truly unique experience, the “restaurant” below is near Kifune Temple, and the platforms are literally over the stream and surrounded by trees. It’s quiet and tranquil. The other place is near Gion by the river on the balconies that overlook the river. The Gion restaurant district is desolate in the day time, except for the occasional delivery guy pushing a trolley about. This is perhaps going to be the most grand train station you’ll ever experience. It has department stores, a few floors of restaurants (some with spectacular views), cafés, souvenir shops, and of course luggage lockers (claim yours before 9am before they’re all taken). The view in this photo below doesn’t even capture a quarter of this building, but you can get this wonderful view in the late afternoon early evening; and yes, that is Kyoto Tower reflected in the windows. Yes, both men and women can rent a kimono, or yukata (for the summer) for the morning or the day. Girls can even be dressed up like a maiko or geisha with the full makeup, hair styling, and garb. Prices start from about USD$50 and up to about USD$100. There are a bunch of places in Gion, and they offer English language support, which actually means, some minimal help. However, it’s actually very easy, so don’t worry about the language gap. This model below was nice enough to write up a story about her experience renting a kimono, thanks so much Mariko. Update: Watch this space for “Another 5 Things to do in Kyoto”.